Sri Lanka would soon bring in a new anti-terrorism law, Prime Minster Ranil Wickremesinghe said yesterday. 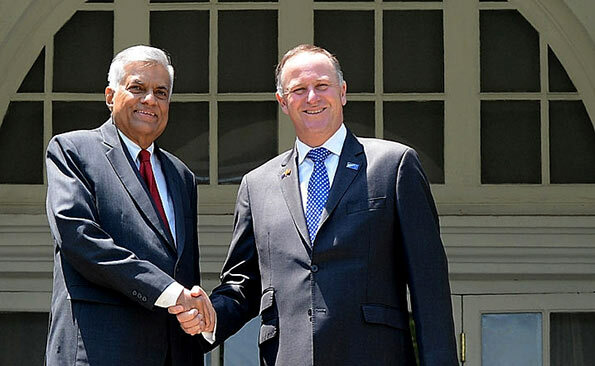 Wickremesinghe was addressing a joint press briefing with New Zealand Premier John Key in Auckland where he is on a visit. “We hope to be able to bring in the draft law soon,” Wickremesinghe said. The New Zealand Green Party and Amnesty International had raised concerns and drawn to the attention of Key, the human rights accountability accusations against Sri Lanka. The Green Party MP, Jan Logie had told Key that Sri Lanka Prevention of Terrorism Act (PTA) had allowed people to be detained indefinitely without charges. Wickremesinghe’s unity government with President Maithripala Sirisena had stated that a new anti-terror bill would replace the PTA. “The government had appointed a committee to look at the PTA and to draft a new counter terrorism bill. This will be done to meet international standards,” said Sagala Ratnayake, law and order minister who is part of Wickremesinghes delegation in New Zealand. Tamil and human rights groups have pointed to the draconian nature of the PTA which was enacted in 1979 during the early days of the LTTE militancy. During the LTTEs over three-decade armed campaign to set up a separate Tamil state, many LTTE activists were held under the PTA. International rights groups have urged the Sri Lankan government to repeal the PTA and release those held under its provisions. and yet again Ranil the impressatio continues to flout his authority without any direction. Laws should be enacted through the existsing legal process which ought to fall inline with the legal process. When Ranil talks of terrorism we are not sure of what it is all about and then consider who or what is a terrorists considering quadrapods also resort to terror to prtect thier domain in our case the elephant that is competeing with man to exist and the universal law comes into operation. The term ‘ terrorist ‘ according to wickramasinghepedia shall be defined as any biped quadruped, ‘ multiped’ or even noped being who promotes or who helps to promote in any way directly or indirectly to oust Ranil Wickramasinghe from any Public positions he may hold now or he may hold in any future day. Such being ,after a non summary proceedings before any Grama Niladhari may be condemned to death. Could you please blog legibly? Please use Onlanka’s spell checker prior to posting even if you have had a couple of shots of good old Gal Arrakku? Thuleepan, YOU ARE VERY, VERY RUDE AND UNKIND to brand me as an alcoholic addict. At my age , eighty six I DO NOT NED IT. Perhaps it is in your family lineage. Hence the unwanted insinuation. Sorry Thuleepan ia was more concerned about the message and as i went along he problem of terror was so complex that i found little time to focus on the spelling. In fact if i were to read before posting then i would not have posted something that happens often anyway I wanted this particular one to be regardless.